There are bits of the metropolis that many Londoners cherish, the view from either side of Waterloo Bridge, Wren’s wonderful cathedral or Big Ben on a cloudy day. I am particularly fond of Soho, Fitzrovia and Shepherd Market. But these are all, in a sense, communal areas. Along with the Royal Parks and the river they constitute a kind of geographic front room for Londoners. But what of the secret corners we cherish or the areas outside the centre we enjoy, the private rooms of our ‘London House’? In my case one of these is Crystal Palace, or rather Upper Norwood as it was prior to the migration of Caxton’s glass masterpiece to it’s heights. Much of the visual appeal of the area architecturally dates from this era and the Victorian love of folly, grandeur and solidity. 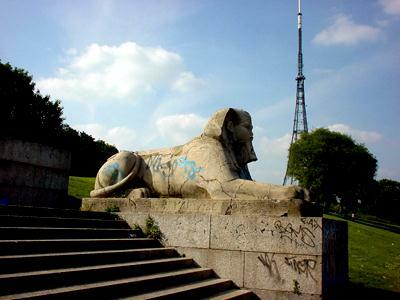 Where else in London do you find dinosaurs, sphinxes, a gorilla and a big television antenna oddly redolent of the Eiffel Tower? In the vicinity are a Palace, a fine Georgian art gallery, two quirky museums, and more open space than most other parts of London (including a remarkable cemetery). 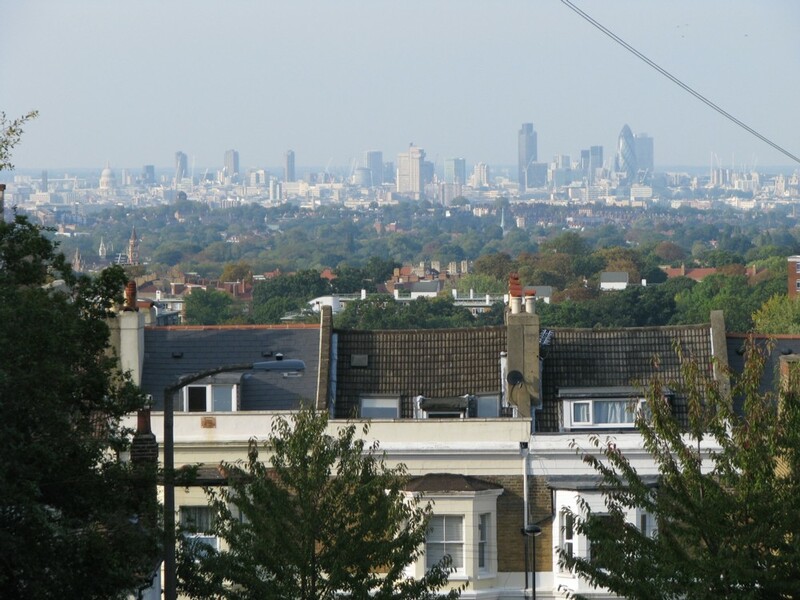 In addition there are views from Central Hill that can only be bettered by Parliament Hill but for my money the southern view is more interesting. Travel back before the Victorians and you have a fancy Georgian Spa, Charcoal burners, gipsy encampments and royal jousting. It also has a bit of a French vibe, due to a long history of eminent French residents (including Pissarro who painted quite a lot of pictures of the area and Victor Hugo). But what of now? It is a bit of an unknown gem, somewhat scruffy around some of it’s edges, resistantly bohemian, full of craftsmen and small businesses. Any excuse for a festival, lots of comedy clubs and ad hoc cinemas in pubs and some impressive events, such as the recent classic car fest using part of the old motor racing track. 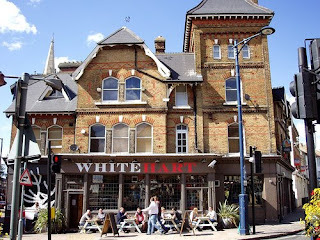 Atmospherically it is very villagey in the way that places like Clapham Old Town were, aeons ago. It is quite laid back yet still very urban with a good mix of people. The yummy mummy crowd for now kept at bay (although the Domali café on weekend daytimes is best avoided by the child averse). It is also a very vintagey area, with Vintage Heart , Vien Vintage, Bambino’s vintage leathers and a new shop with mens fifties clothing that I have not seen yet. This is in addition to Haynes Lane. You have to poke around a bit to find all this wonderful stuff but combine a day in the park with a bit of nostalgic shopping and then a drink and a meal in one of the areas many pubs and restaurants. Then get on the new train line back down to Dalston, we are happy for you to visit and enjoy the vibe but the place is ours, all ours (cue demonic cackle). In any case you don’t know us Sarf Londoners any thing could happen if you linger too long….. 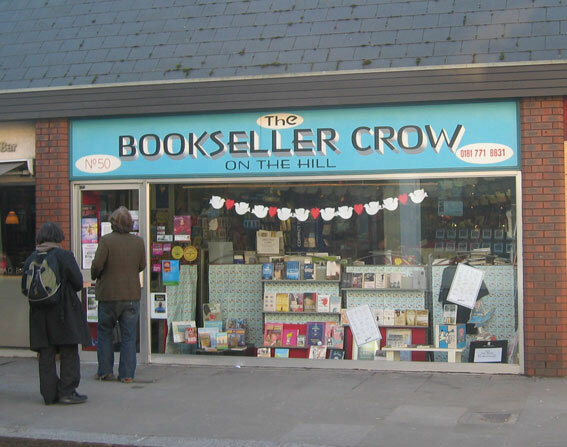 The Crow on the Hill. A real bookshop. The antithesis of corporate sterile bookselling, whats left of it. 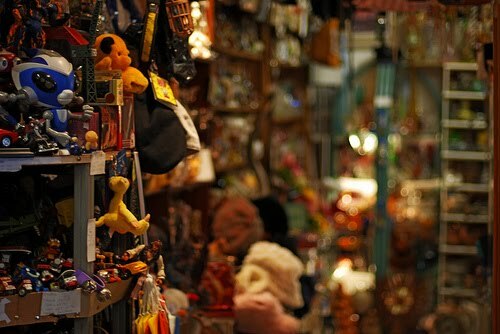 A faintly chaotic feel which entices you to rifle through shelves of well chosen books with a local slant. Clearly chosen by people who read and know their customer base. Stocked one of the Chap books, a clear sign of discernment! Haynes Lane Market. A real ramshackle flea market full of small emporia jammed into two floors of a ramshackle building. A real rummage can produce pearls: good cufflinks, bric a brac and jewellery. All at proper prices. Still kicking myself for not buying that Victorian leather top hat case for a fiver… Also notable are the shop Bambino which is full of good stuff, particularly old leather biker jackets and the antique furniture market jammed with characterful bits of wood for your house. Numide. Damn fine merguez. Run by a Brel/Soccer obsessed chef who produces and serves in this small romantically gloomy restaurant some very good French food with a North African edge. 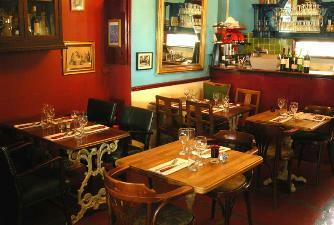 The down stairs bar is atmospheric, sells good plonk, has an amiable barman and a tiny little outdoor space. Must book in advance for restaurant. Crystal Palace actually has a huge number of cafés and restaurants in relation to it’s size, Tamnag Thai sells the best Thai food I have had in this country. One reason why it has ballooned into a huge restaurant over the years, despite which you will still have to book at the weekends. Yours truly used to be a bartender at Joanna’s. a slick professionally run restaurant. The Gurkha Cottage sells high quality Nepalese food with some unusual dishes. Café wise I rate the Little Palace Café, very much a caff, with good portions and decent food. For Francophiles, Café St Germain on the parade is pretty much the real thing, transported to Central Hill. Sit outside with a croque madame and a chilled beer. 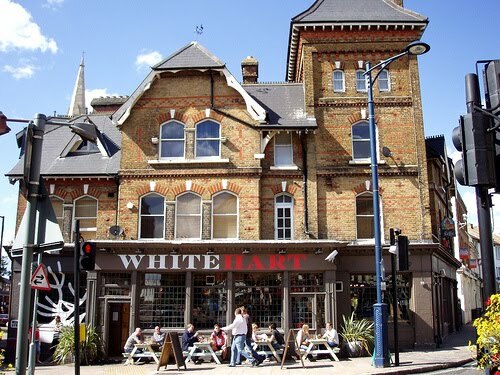 Pub wise I tend to prefer the shabby White Hart, shabby in a trendy way. 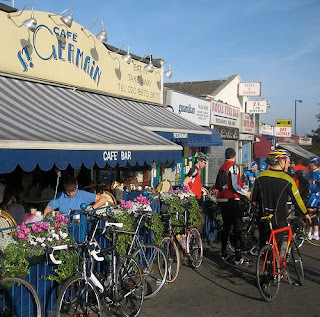 The place is jammed with bars and pubs of all kinds from trendy to reassuringly old school. Although beware of some on match nights, Selhurst Park is not far away. Bar wise it has to be the Numide bar. 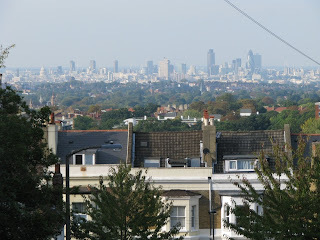 Or walk down central hill for 15 mins to the Park Tavern…a couple of the pubs have a view from gardens in the back. The place has a much nicer feel at night than most outlying reaches of London, perhaps because the punters are a mixture of affluent, gor blimey and whappen? 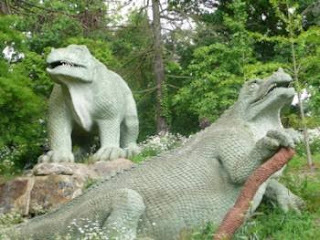 Crystal Palace park, apart from the dinosaurs. the children’s zoo, the terraces of the original Crystal Palace, the museum, the Olympic stadium, probably Englands first racing circuit, the lake and the Victorian bandstand there is lots of grass. You can stuff your East London.. we’ve got saurs! love this post i'm a sarf londoner myself and love a day out in palace park. I do love our dinos.. Although I am very far away from London I can appreciate this beaty!